FC Barcelona’s preseason is starting to take shape. Over the next few days, the club will be revealing which teams it will be meeting in the build-up to the 2014-15 season. 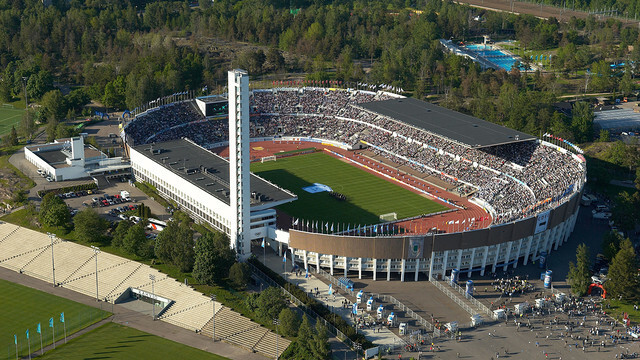 And the first to be announced is HJK Helsinki, who Barça will play on Saturday 9 August in the Olympic Stadium in the Finnish capital, which has the capacity for 40,000 spectators. The stadium that hosted the 1952 Olympic Games will be witnessing the first ever meeting between these two historic clubs. Founded in 1907, HJK are currently enjoying one of the most glorious periods it has ever known after setting a new record of five Finnish league titles in a row. The squad includes legendary Finnish internationals like Mikael Forssell and Teemu Tainio, alongside young talents such as Nikolai Alho and Robin Lod, as well as foreign imports of the calibre of Gideon Baah and Mac Kandji. The game will be also a Respect-game for Jari Litmanen, formerly of both HJK Helsinki and FC Barcelona, and who will be acting as ambassador for this event. HJK Helsinki is well known for its commitments to charitable causes and corporate social responsibility, a philosophy that it shares with FC Barcelona. One example of this is how the potential proceeds from this match will be used to build a new indoor pavilion where young people in Helsinki will be able to play football in winter, a time when all the outdoor pitches in the city are covered in snow. Like Barça, HJK are also admirably committed to youth football, with over 2,500 children currently benefitting from its academy. So, this match fits perfectly with FC Barcelona’s traditional quest to combine friendly matches with social causes and the promotion of sport among young people. For several members of the Barça squad this will not be their first visit to the Olympic Stadium. Indeed, it was in this same stadium that Spain played Finland in a 2014 World Cup qualifier last September 6. Spain won that game 2-0 and the line-up included Xavi, Iniesta, Cesc, Pedro and Alba, the latter scoring the opening goal of the night. Next Next post: Luis Enrique's return very closely resembles a couple of points from when he first arrived. Do you know what they are?